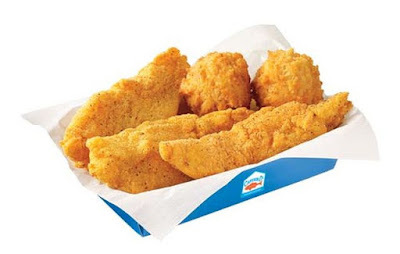 Captain D's offers new $3.49 Snacks as a value offering with a choice of either fish tenders or butterfly shrimp paired with hush puppies. Specifically, the Fish Tenders Snack includes three Southern-Style fish tenders, while the Butterfly Shrimp Snack includes eight crispy-fried butterfly shrimp. Additionally, the fast casual seafood chain brings back its 10-Piece Family Meal for the season. For $19.99, the meal includes 10 pieces of battered and fried fish, two family-style sides, and hush puppies. Both deals are available at participating locations for a limited time.